Review: The ever impressive Welsh producer Tom Ellis returns with a brilliant new four tracker for Parisian minimal heroes Telegraph. The Moda Di boss and Freerotation resident follows up some terrific releases on the likes of Minibar and homeboys Untilmyheartstops with these four esoteric excursions on Music For The Symbol Minded. Hypnotic polyrhythmic grooves dominate the record's first side, with the upbeat tribal vibe of "Because They Couldn't Broadcast" delving deep into the exotic, soon making way for the looped-up percussive tool "Half Left". The flipside highlight was definitely the shuffly minimal-funk of "Just 10 Minutes Of Your Time". 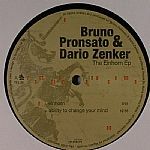 Review: "The Einhorn EP" with Dario Zenker marks the come back of Bruno Pronsato on Telegraph. The release includes 2 marathon tracks between live and production. After living in Wasserburg, Dario Zenker comes back to Munich. He began his DJ career at the Ultraschall club alongside the likes of Acid Mario or Vitalic vs The Hacker & Hometrainer. 2006 is the year of his first productions on Balcon, Num and Telegraph. Bruno Pronsato (aka Steven Ford) has been subverting expectations within techno's upper echelons since 2003 but the Seattle producer took a circuitous path to reach his current lofty status. After his acclaimed releases on Orac, Musique Risquée, Milnormodern and Telegraph, 2006 would be the year of his consecration!